Last summer wasps colonised the underhang above our front door and with mixed feelings I zapped the nest with spray foam. This year swallows chose the same place. The nest took shape and on 12th June the parents began to sit on it. Through the window over the door was a good vantage point and I watched for much of the next 3 weeks. Surely they shouldn’t leave the eggs for so long on such a cold day? Eventually they hatched and the sitting switched to non-stop airlifts of food and refuse collection. The parents spotted me behind the stack of books in the windowsill that acted as my hide and screamed as they hovered in front of the lead panes. Each morning I’d take a look until Sunday 10th July, 8 days later, the nest was gone. Outside in the pouring rain, there it was on the stone slabs. One dead on its back, the other two face down in the nest but breathing, parents out of sight. I looked in my workshed and improvised a nestbox out of a plastic shelving tray covered with a plank fixed by rubber bungee. A lump of timber to weigh it down and wedge the nest in place with a stick across the front to stop it falling out then placed it on the nearest windowsill. When the rain eased off the parents returned, one with its beak full of flies, and flew repeated sorties into the corner where the nest had been. Frustratingly they perched nearby but failed to look at my impromptu haven. I got a laptop to the open window and played back the sound of baby swallows crying for food, but still they didn’t get the message. 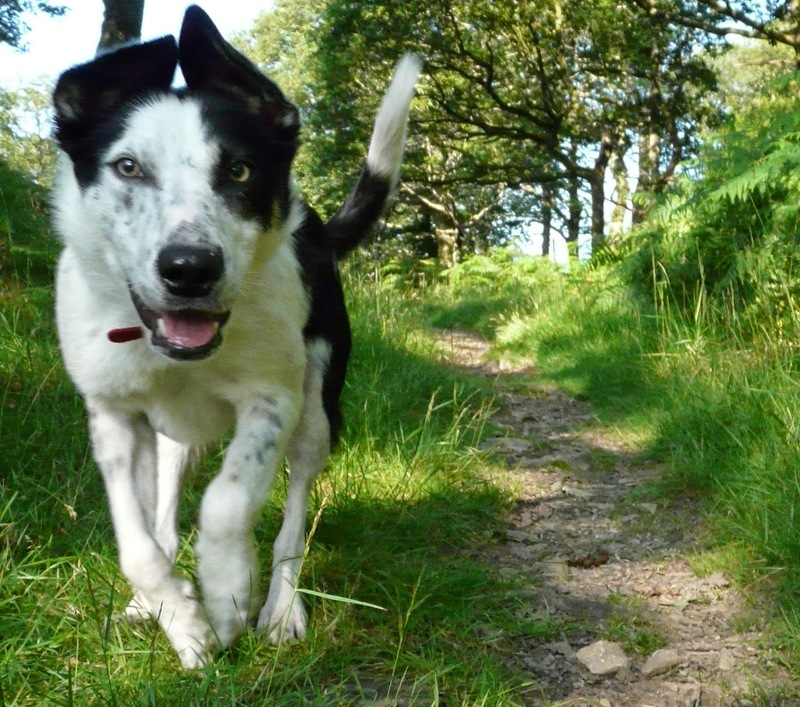 After 20 minutes of pressing the play button I gave up on the strategy and, feeling quite sad, took the dog for a walk. By the time I got back the parents were flying into the new position of the nest feeding their remaining 2 chicks. By now I felt as involved, committed and protective as the natural parents and enjoyed watching their progress. For some reason I was not expecting their maiden flight until much later but on 18th July off they went. They both struggled but one of them made it to the greenhouse roof and subsequently took up residence in the workshed. The other hopped around beneath the nest unable to fly but calling out each time the parents came by with food. Its wing was damaged and the rain was pouring down once more. I filled a beach bucket with wood shavings and rested it on its side in the dry beside the front door. By the time I went to bed the chick had settled in to its shelter. For the next 2 days I watched as the chick seemed to get stronger but no closer to flying. Someone said I should put it out of its misery, but I didn’t. 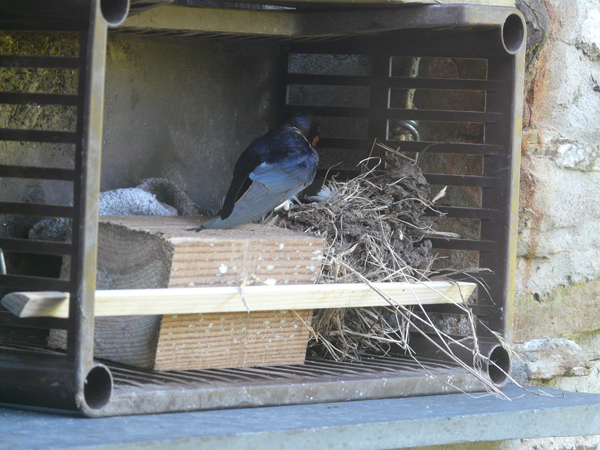 In recent weeks the house had sprung a couple of leaks through the roof but I delayed calling a builder because of the nesting swallows. As the nest was no longer in use I called him and as he drove up he ran over the crippled baby. I didn’t have the heart to tell him. If you can bear to watch it here’s the video diary. At least 1 survived. From Campbell’s Cottage to the top of Snowdon seemed quite achievable and on 24th July 2011 the conditions were just right. Off we (Haydn and Huw) set with provisions and the GPS zeroised. I’d estimated 1 hour to Stwlan, 1 hour to Llyn Adar and a further hour to the start of the Watkin Path. Each leg was under-estimated and it took almost 3.5 hours to cover those 8.8 miles. Despite being a fine and sunny Sunday at the start of school holidays the path was quiet. A few bathers splashing in the turquoise crystal pools above Hafod y Llan. The view across Llyn Llydaw was superb. For the first time in several years I approached the top free of cloud – on previous occasions it had been a scramble steeply through the mist but this time I was able to follow the more gentle angle to the ridge then turn right to the summit. French, Welsh, English, German, walkers, train passengers, all shapes, sizes and ages... it was really cosmopolitan and busy, busy. By the time I squeezed my way onto the compass at the top it had been 5 hours and 51 minutes since leaving home 13.2 miles away and an estimated 1,600m altitude gain. A drink and some jelly babies before descending the ridge overlooking the Watkin Path towards Y Garn then into Caffi Gwynant (brilliant community cafe) for ice lolly and ‘Powerade’. Heavy legs plodded up the narrow lane then through meadows alongside streams to Llyn Llagi and up to the plateau between Snowdon and home. At Rhosydd quarry we turned down into Cwmorthin, adding an extra mile, but avoiding the steepness from Stwlan. Weary legs back home 27.5 miles, 12 hours and 15 minutes since setting off. What an adventure. We are offering a bottle of Champagne as a prize to the first guest at Campbell’s Cottage who can better the time! There’s never a dull moment on the Ffestiniog Railway. Today, 23rd July, we saw Linda and Blanche, fresh from the Boston Lodge paint shop, in lined FR Green livery. This is the first time the two ‘ladies’, which date from 1893, have appeared together in pristine matching livery. As if that wasn’t enough excitement for one day we were treated to an exceptionally long gravity train! 40 miles west to Aberdaron then 25 minutes on the boat to Bardsey Island. A pilgrimage you'll never forget, whatever your religion. Only 2,000 day visitors a year are allowed onto this pristine nature reserve. Seals, puffins, razorbills, kittiwakes, choughs, manx shearwater, risso's dolphins and the spirits of thousands of saints. Was this really Arthur's final retreat? The sound of Sunday morning rain warranted a lie-in but by 7:30 the day was beckoning. I dressed and knelt down to peer out of the bedroom window at the nest of baby swallows, but it was gone. It had fallen 10 feet or so and 1 of the chicks was dead on its back. 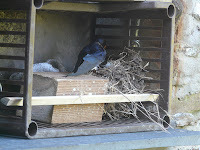 The other 2 occupants were face down in the nest, but breathing. Still raining, no sign of the parents, what to do? I scoured the shed and found a shoe-box size plastic shelving tray, strapped a board over the top, wedged the nest with a block of wood and an old sock. Finally a stick across the front to stop anything falling out then placed it on the nearest windowsill. When the rain eased off the parents returned, 1 with its beak full of flies, and flew repeated sorties into the corner where the nest had been. Frustratingly they perched nearby but failed to look at my impromptu haven. But on my return what joy, there were the parents flying in and out with food and removing the poo sack. From the overlooking window I can see only 1 chick so I suspect the other must have died. Will it stay in the nest or will the parents throw it out? In the meantime the 8 day old surviving swallow is getting lots of rations and parental care. 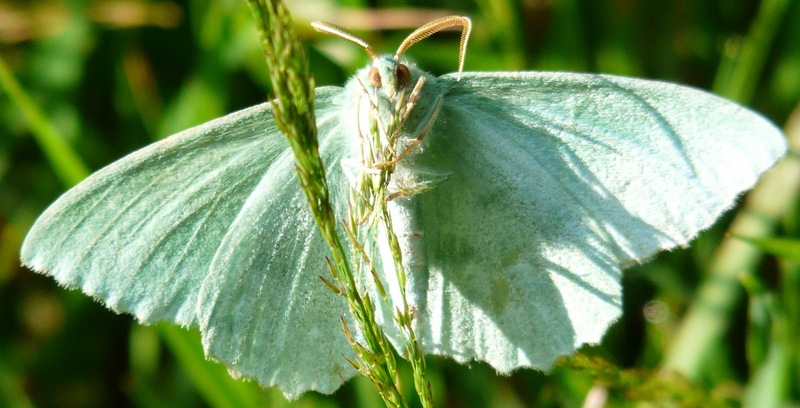 Walking Molly (dog) through the woods today I chanced upon a greenish moth. As I lined it up for a photo, Molly got jealous of the attention and barged between me and my subject. The obliging moth clung onto its perch and I got my picture, good enough to identify it on the moth website. Just typed in ‘green’ on the search facility and there was an id parade of all the likely suspects. Not the Essex, nor the Sussex but the Large Emerald. What a treasure, but apparently they are quite common.